Dr. Stamoulis is graduate of Universidad del Noreste, Tampico, Mexico. He completed his medical residency, neurology residency and a cerebrovascular fellowship at Brown University/Rhode Island Hospital. He has been practicing Neurology in the local area since 2004. 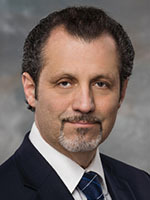 He is board certified by the American Board of Psychiatry and Neurology and the American Society of Neuroimaging and Neurosonology, and a Fellow of the American Heart Association Stroke Council.